I recently received an email about the status of an FOIA appeal after I asked for an update. The original FOIA request was submitted to the National Archives and Records Administration (NARA) in 2016. It was about circumstances surrounding Joint Security Control (JSC) and its activities in 1946 and 1947. "We have identified and gathered all the responsive documents for your case," Deputy FOIA Officer/Archivist Jodi L. Foor of NARA wrote in a Nov. 13, 2017 email. It's not entirely clear if Foor is suggesting that documents previously not provided by NARA were indeed located, making the appeal valid, or if the FOIA officer is referring to some other kinds of material. I guess we'll have to wait and see, and we're unfortunately going to be waiting a while. "We are estimating that we will be able to start working your case within 10 to 12 months," Foor added. "We do apologize for the delay but assure you that we will complete your case as soon as possible." The work of James Carrion peaked my interest in JSC and its potential significance to UFO history. He documented how JSC was initially founded during WWII as a high level deception planning unit. It subsequently received a revised charter in May of 1947 to classify and protect important information, and to plan and implement deception operations during times of peace (as well as war), among other responsibilities. In related news, Carrion recently published two more posts on the topic at his blog, Anachronism. He explores direct links between members of JSC and mid 20th century UFO reports. It was such circumstances that first motivated my Sep. 6, 2016, FOIA request to NARA. 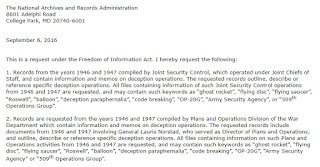 See images below, in which I asked for copies of files on JSC deception operations and related items. The request was initially met with a less than helpful response. NARA Archivist Mr. R.E. Cookson suggested I order an already declassified JSC file. He added, "The remainder of your request consists of topics rather than describing specific documents, and therefore is not reasonably specific enough for us to be in a position to easily locate documents responsive to your request. A preliminary search of the finding aids that are available to us reveals that your request could contain information in any one of 4 record groups." I appealed in Oct., 2016, seeking further review of the FOIA request. I pointed out that some specific items were indeed requested. 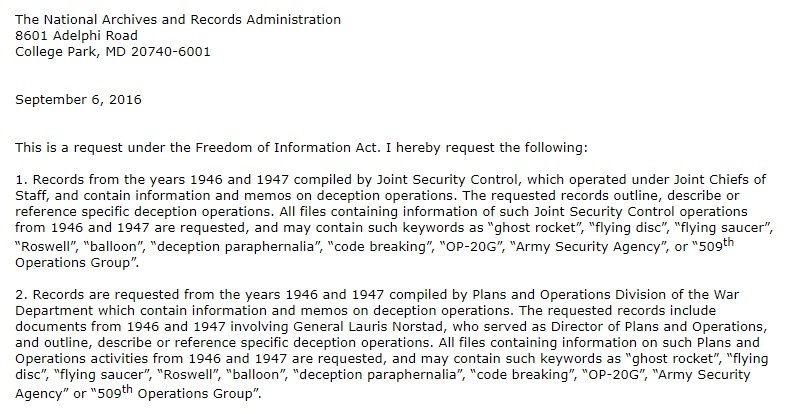 I also asked consideration be given to the fact the very declassified documents Archivist Cookson referenced, as well as others readily available for presentation (as cited by Carrion, for example), established that the creation and responsibilities of JSC included the execution of deception operations. I subsequently requested deeper consideration be given to how a researcher might otherwise learn about such established operations than request their files and the documentation contained therein. (a) This "flying saucer" situation is not all imaginary or seeing too much in some natural phenomenon. Something is really flying around. (b) Lack of topside inquiries, when compared to the prompt and demanding inquiries that have originated topside upon former events, give more than ordinary weight to the possibility that this is a domestic project, about which the President, etc. know. Special Agent (S.W. Reynolds) of the Liaison Section, while discussing the above captioned phenomena with Lieutenant Colonel (K.C. Garrett) of the Air Forces Intelligence, expressed the possibility that flying disks were in fact, a very highly classified experiment of the Army or Navy. Mr. (Reynolds) was very much surprised when Colonel (Garrett) stated it was his personal opinion that such was a probability, but confidentially stated that a Mr. (X) who is a scientist attached to the Air Forces Intelligence, was of the same opinion. Colonel (Garrett) stated that he based his assumption on the following: He pointed out that when flying objects were seen over Sweden, the "high brass" of the War Department exerted tremendous pressure on the Air Forces Intelligence to conduct research and collect information in an effort to identify these sightings. Colonel (Garrett) stated that, in contrast to this, we have reported sightings of unknown objects over the United States, and the "high brass" appeared to be totally unconcerned. He indicated this led him to believe that they knew enough about these objects to express no concern. Colonel (Garrett) pointed out further that the objects in question have been seen by many individuals who are what he terms "trained observers," such as airplane pilots. He indicated also that several of the individuals are reliable members of the community. He stated that it his conclusion that these individuals saw something. He stated the above has led him to the conclusion that there were objects seen which somebody in the Government knows all about. It is intriguing that both Air Force Intelligence and Air Defense Command personnel were puzzled by the obvious lack of concern from upper echelons and were convinced that someone at a higher level was in the "know". Neither questioned the reality of the sightings. If UFOs were indeed being used for counter-espionage purposes, it makes sense that higher authorities would not be alarmed over these UFOs violating U.S. airspace. FLYING DISCS – The Bureau, at the request of the Army Air Forces Intelligence, has agreed to cooperate in the investigations of flying discs. The Air Force have confidentially advised that it is possible to release three or more discs in odd numbers, attached together by a wire, from an airplane in high altitudes and that these discs would obtain tremendous speed in their descent and would descend to the earth in an arc. The Army Air Forces Intelligence has also indicated some concern that the reported sightings might have been made by subversive individuals for the purpose of creating a mass hysteria. I find these specific lines of research interesting, regardless of what varieties of circumstances might possibly be found in any number of other UFO reports from different eras. Furthermore, I want to know more about JSC, its interactions with intelligence agencies, and its deception operations whatever it all proves to involve. It's historically significant from any number of perspectives. Let's hope NARA will help with that.